Crockpot roast beef is one of our favorite recipes. There is nothing like a good roast with gravy, potatoes and carrots. My children ask for this crockpot roast beef even on holidays. I make this roast beef in a 3 quart crockpot. You can use a bigger one if you like, just increase the amount of beef and veggies to suit your needs. All you need is to maybe add a green vegetable and some cornbread for a meal. This crockpot roast beef will keep in the fridge for several days and is even better leftover. 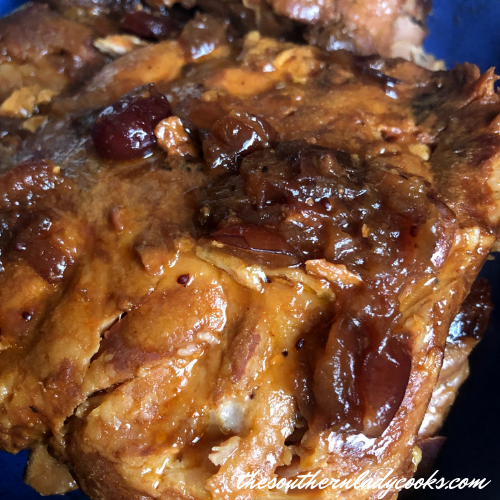 This makes a wonderful pot roast to serve to guests and the gravy is delicious. I have made this recipe for years and it is one you will reach for time and again and the best comfort food ever! I brown my roast in a skillet on top of the stove before adding to crockpot but this is not necessary. You can just add it without the browning. 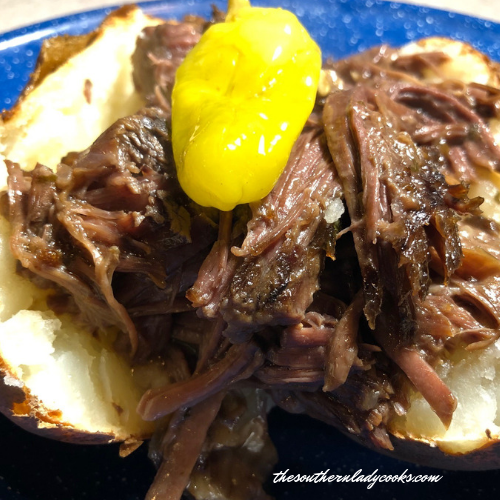 Crockpot roast beef is delicious and easy. Add roast, potatoes, carrots, and onions to pot. Mix dry onion soup with cream of mushroom soup, salt and pepper and pour over the meat and vegetables. Cook seven hours on low heat or until vegetables and meat are tender. ENJOY! If you like this recipe, you might also like my recipe for Juicy Beef Roast. This Crock Pot Roast is wonderful after a long day. The gravy is amazing! Cook seven hours on low heat or until vegetables and meat are tender. Don’t Forget to Pin Crock Pot Roast Beef! I made this today. Went exactly by recipe. It turned out wonderful and was soo delicious and was NOT hard to do.. throw it all in pot and turn on. Just make sure your crock pot is large enough. Mine became too full and I had to take some out.. Roast was tender and I loved the gravy it makes. I know this is delicous, thank you for sharing. I made this yesterday – I cooked it for 5 hours on high and it was ready when we got home from church. Sooo good! Finally ~ a WINNER of a beef stew for crock pots. Thank you, Judy. This is absolutely delicious! I did only use one packet of onion soup mix as I was using a small roast (but tons of veggies), and I omitted the salt. Definitely a keeper! You could make this in the oven, too. Just look on about 350 until roast and potatoes are tender. the crockpot roast beef was really tender and the veggies were very good also. this will be another cold weather reciept. Oh YUM, this sparked a meal in the making for tomorrow, thanks Judy. Wow, that looks tender. I don’t own a crockpot, but it makes me want to make stew. Oh Judy – I knew you were a woman after my heart! This is MY favorite meal also – hands down! Your photo looks soo delicious. Simple recipe too – MMMM!